Okay, this was back in September, but it's not a whole lot different now. Okay, trying to get back into the habit. I have been in a non-writing, non-reading, non-pretty-much-everything mood for a while now. Not sure why. But I went to Valley Mills for a writing weekend with three friends, and found the writing-is-fun mindset again. It took me a while. I read several books, and goofed off a lot, but I also brainstormed plots with "the girls"--theirs and mine--and wrote through the bad moods until I discovered the way out of the parts where I got stuck. And I've been having a good time this week with the writing. Also, I discovered that the ripple in my vision is from a genetic anomaly--an extra blood vessel in my eye that leaked, but no fluid is collecting, it's not macular degeneration, and the doctors say that no other treatment is needed until and unless it gets a whole lot worse. No shots in my eye. It's my right eye, which isn't the good eye, so the ripple is hard to notice. Good news. I'm doing Weight Watchers online for at least the next three months. Wish me luck. I've been on it for a whole week, and have lost 0.2 pound. Better than a poke in the eye with a sharp stick, though. Fixing to head out for a walk up on the seawall. Typical me. I set a goal of posting blogs more regularly, and then I don't. But I'm back. Don't everybody get all excited at once. I have to get up and find a box to pack my grandbaby's birthday present in (she's almost one!) and wrap it and mail it, but it's raining and I don't want to go out. Not even into the garage, the retirement home for boxes. But I will, because grandgirls only have a first birthday once. Before I do, though, I'm going to post this blog. I am determined to post it. Anyway, the thing that really motivated me to post this blog was the food we ate last night. We ate at home. You see, I went to Target yesterday afternoon to buy fish oil tablets and shaving cream and stuff, and wandered over into the new food section to see if they had anything interesting that I could cook for supper. I wasn't feeling inspired by the stuff I had in the freezer at home. And in the freezer section, where the fish and frozen shrimp was, I saw a package of crawfish tails. 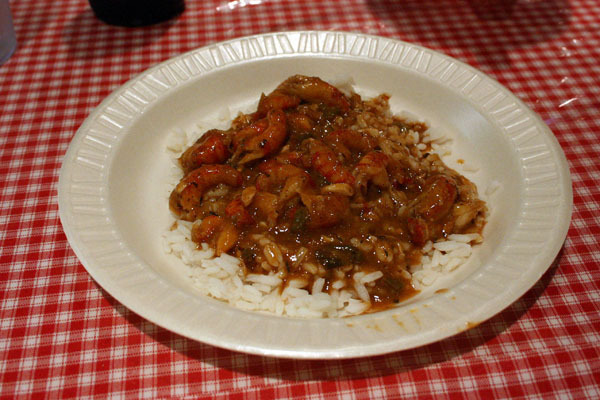 Suddenly, I was inspired and struck by a desire for some crawfish etouffee. Sometime last year, we went to one of our favorite restaurants--one just around the corner--and I ordered their crawfish two-ways dish, with etouffee and fried tails. And I was shocked to the bone because their etouffee was BLAND! It didn't even have much in the way of salt in it, much less that Cajun "kapow!" This is a good restaurant, with food we enjoy, but I had to break out the Tabasco and pepper to get it up to edible level. So, I figured I could come up with a decent etouffee, making it myself. All the recipes called for chopped onion and bell pepper. Most of them called for chopped celery too, but I didn't have any. Not all of them called for celery, though, so I figured I could leave it out. Some recipes didn't call for any cayenne or anything spicy. In fact, some recipes didn't call for any additional spices or herbs, or anything but the onions, bell peppers and celery, and I wanted Spice! There was one recipe that called for cream of celery soup and Rotel tomatoes. I don't have anything against Rotel, but we don't use cream-of soups here because they have wheat flour as a thickener and the fella's gluten-free. And in fact, most of the recipes called for a roux--flour and oil cooked brown. Which means I had to sub something else. I decided on the first Crawfish Etouffee recipe in the Louisiana cookbook, mostly because it had the most spices in it. It also explained how to boil the whole crawfish, and called for "crawfish water" (aka, the water you cooked the crawfish in) in the recipe. Since I didn't boil my own crawfish and didn't have any crawfish water, I didn't drain the frozen crawfish, but put them en masse into my skillet, with the water from their package, and threw in a couple of seasonings from the boiling pot--like a bayleaf and some cayenne. Start your rice cooking first. (If you're using a rice cooker--be sure to plug it in! I didn't notice mine wasn't, and probably simmered things too long.) Then start the etouffee. Melt the butter in a large, heavy skillet. (I was afraid my cast iron skillet wouldn't be big enough, but it would be.) Add onions, bell pepper, celery and garlic, and saute over low heat about 20 minutes, or until the vegetables are very soft. Add the crawfish tails, tomato paste, seasonings and water. Mix well and simmer while your rice is cooking. (You may want to add more water. I did. It didn't look liquid-y enough. I probably added about another cup.) Taste it and adjust flavorings--after you are through dancing around and crowing about how tasty it is--it will need at least a little salt, maybe some pepper, though with the cayenne, maybe not. Cover and let it simmer another 5 minutes. Stir in the cornstarch and water mixture, cook and stir until the etouffee is slightly thickened. If you don't need gluten-free, or have a corn allergy, or something--add 2 Tablespoons of flour to the melted butter and brown it a little before you add the onions and such. That's the only difference. You can always substitute 1/2 the amount of cornstarch for flour, up to 1/2 cup of flour. And don't brown the cornstarch. Makes it taste funny. Kind of floury. Just add it at the end, like this. Oh, and this would be really good with shrimp too. Crawfish is a little bit sweet (like lobster), but anything you can do with crawfish, you can do with shrimp. Go for it!